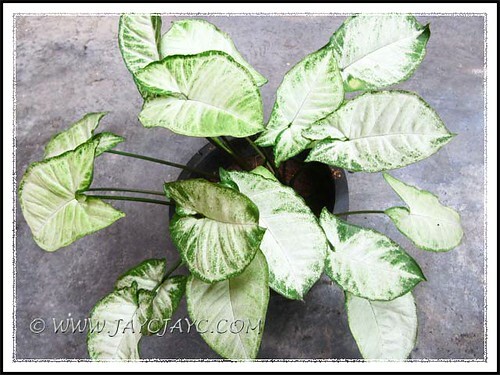 Syngonium podophyllum or commonly known as Goosefoot Plant and Arrowhead Vine/Plant has beautiful variegated leaves that come in variable shades of green, white, cream, yellow and pink, as well as in various leaf shapes and sizes. 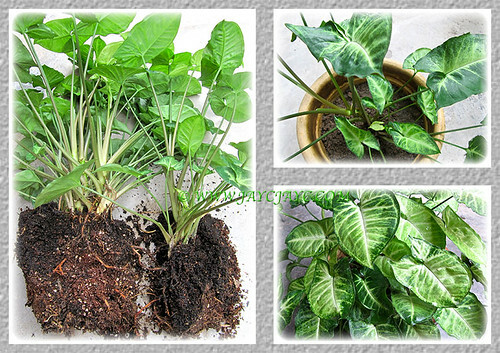 It is an attractive, elegant and versatile plant that is popularly cultivated worldwide. 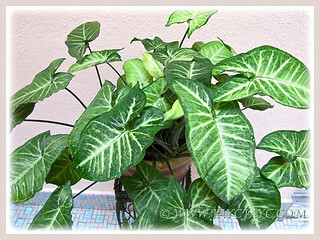 Mostly, as an indoor plant and used as a decorative specimen. It thrives well outdoors too as a garden ornamental, trained as a climber on a moss pole and trellis, espaliered on a garden wall or allowed to trail/creep as a ground cover in beds and borders. Syngonium podophyllum which is native to Mexico and southwards to South America, can be easily propagated in various ways without much fuss. 1. 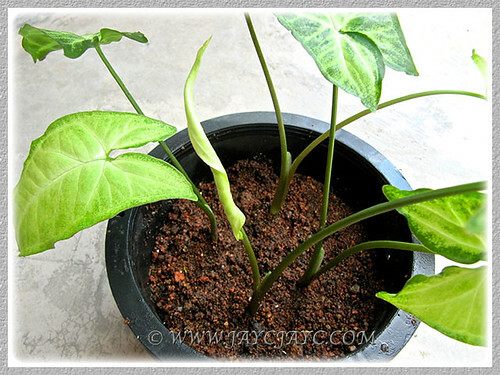 Carefully remove the plant from its pot when the soil had become congested with roots. 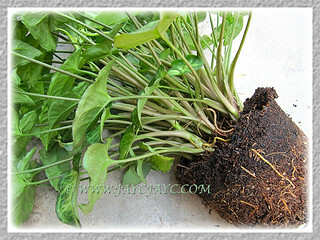 Then use a knife or something similar to divide the clump into smaller sections, complete with the roots. Gently shake away the excess soil from its roots. I’ve divided my potted clump into two unequal sections, one larger than the other as illustrated in the image below. My motive was to have the larger and bushier clump, ready for use as a decorative specimen for my garden porch, whilst the smaller section was specifically for this post on propagating. If your plant is on the ground, just dig out a section from the established clump with a spade and plant elsewhere to propagate new plants. 2. Plant the sections in separate pots or in the ground as desired. Repot each division in fresh garden soil, ensuring that the growing point is above the soil. Gently firm the soil around each division. Then water thoroughly through and locate it at a warm and semi-shaded site. 1. 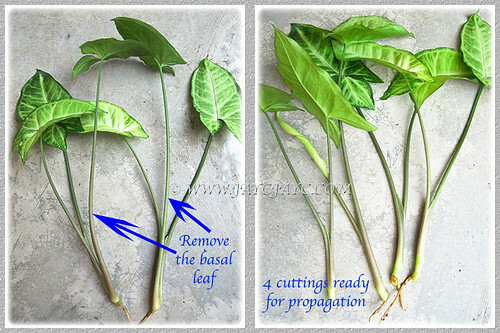 Cut a shoot tip or a stem section from a healthy plant with a sharp knife just below the leaf joint. 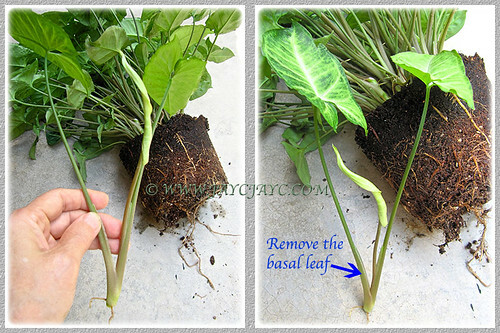 Remove the basal leaves, retaining one or two leaves. Get a few more cuttings the same way. 2. Fill a pot with fresh garden soil. Make several holes about 3-4 cm deep with a pencil and trust a cutting inside each hole. Gently firm the soil around the stems. Water them thoroughly. 3.Locate them at a warm and semi-shaded site. Keep soil moist and with regular misting to maintain humidity, roots will develop within 2-4 weeks. The image below which was taken 4 months after propagation shows their healthy growth. However, the variegation is much lighter as the pot was located at our porch with low light. Increase exposure to bright light or more sunshine to obtain better foliar variegation. By the way, another alternative way to root stem cuttings is placing them in a bottle or jar of water. You can then pot them when roots emerge or transfer them to a water-filled decorative vase to beautify your home indoors. Just the information I was looking for. Great step by step a I appreciate the photos. Thank you so much for taking the time to post your article, complete with pictures and easy-to-follow instructions. I just got this plant at Walmart last night. The leaves are very light in color, like your porch plant. I had never seen leaves that were light like that, so I wanted to find out how to make more of them from the ones I bought. I didn’t realize, until reading your article, that the color was due to low light exposure! LOL Thank you so much. This article really helped me! Many blessings to you!